It’s time; you have teamed up with Schreiner Realty, and together, you all found your dream home. Congratulations! A new home is like a blank canvas—it’s a fresh start with endless possibilities. Buying a new home is an exciting time, but as we all know, the actual, physical act of moving is somewhat less enjoyable. We don’t want your homeowner’s excitement to be dulled because of your pending move, so we have come up with a list of easy steps you can take to make moving less of a headache. You and your family are our priority when it comes to buying or selling a home. The trusted realtors at Schreiner Realty are your real estate experts offering 15 years of professional experience. Our approach to business is family-oriented, and we are extremely thorough in all communication when you decide to team up with us. Remember these tips when you are preparing for a move, and the entire process will be a cinch. Before you know it, you will be in your new home, feng shui-ng your bedroom and hanging family photos. 1. Jot down a list of things you need to do before your move. When you have Schreiner Realty by your side, the months and weeks up to your move will be exciting and completely stress free. We will maintain honest and constant communication so that you will never have to wonder what is going on throughout the buying or selling process. This being said, a lot goes on during the weeks before a move—remember all of the important things you need to accomplish before your move and jot them down on paper. Make the list a “working document” that you keep in your purse or wallet, and add to it when you remember other significant to-dos. With each task written down, you will easily be able to go back and check things off the list. And when you notice you have conquered every single to-do, you will rest assured that everything is taken care of. We have also noticed that writing things down can help minimize stress because many times, the list in your head seems infinitely longer than the list you end up writing down. You might feel like you have so many things to do before your move, but when you jot down everything on paper, you may notice that the list is much shorter and more manageable than you imagined! 2. Slowly start packing a month before your move. One of the biggest moving-related issues we hear is the classic tale of waiting until the last minute to start packing. When moving day rolls around, you should be completely packed, including an overnight bag of clothes and important belongings, just in case. If you wait until the week of your move to start packing, you are going to experience unnecessary and avoidable stress. So, the easy solution is to pack slowly over the course of the month. Start with rooms that you rarely spend time in or rooms that are full of forgotten knick knacks, books, furniture, etc. If you haven’t touched your sewing machine in three months, you probably won’t be using it anytime soon, so put it in a box! Slowly but surely, go room by room and pack up the belongings you can do without for a month. Before you know it, the entire house is going to be boxed up, and you will sleep soundly knowing you are ready for moving day. Place an assembled cardboard box in each room in your home and gradually start to fill the boxes with your belongings. Trust us, this easy step will save you from experiencing so much unnecessary stress when moving day rolls around. 3. As you pack, set up a box and fill it with clothing and other items you want to donate. We understand—sometimes it’s hard to say goodbye to old, nostalgic belongings, but ask yourself this: before you started to pack and found your old baseball card collection, did you remember those 10 folders of baseball cards even existed? If the answer is no, your cards are probably going to play the same role in your new house as they are in your current house—dust collector. If you have more valuable cards that you want to sell, there are great online resources where you can sell your cards—use your profits to treat your family to dinner and a movie after you move into your new home! Moving into a new home is a fresh start, so make, “out with the old, and in with the new,” your mantra when you find that pair of bedazzled bell bottoms stuffed in the back of your closet. Take the memories, but leave the bell bottoms. Donating old and unforgotten belongings is also a great way to ease your packing load. Even if you only donate some old kitchenware, it will still be less for you to pack! 4. Keep a Sharpie with your packing tape to remind yourself to label your boxes. 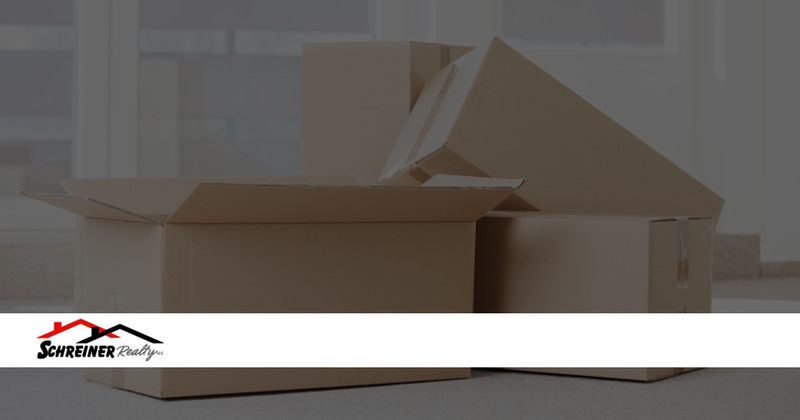 Labeling your moving boxes is an important step in the moving process that is often overlooked. When you get to your new home and start unloading, the entire process will be so incredibly streamlined when your boxes are labeled with two things: the name of the room the box belongs in and the box’s contents. This will save you so much time and energy because you won’t have to move your boxes twice. If you don’t label your boxes, when everything is unloaded you are going to have a giant stack of boxes in the middle of your home without a clue about where anything belongs. What happens when you’re ready for a relaxing shower and your shower curtain is packed away in one of the unlabeled boxes? You either have to open and search through every box, or you need to jump in the car and scoot to the store to buy a new one. Avoid this headache by labeling your boxes–easy! And don’t forget to include important information like, “Fragile” or “This Side Up,” on the boxes do that you don’t accidentally set a fragile box down, upside down. 5. Strategically plan your exact move date and time. There are so many things you need to consider when you are planning the day and time of day that you move. If you live in Gilbert, Tempe, Mesa or Chandler, you know when the hottest part of the day is. Avoid the scorching sunshine and start your move early in the morning! If you start early enough, the roads will be clear before morning rush hour and you will have an easy and stress-free drive to your new home. When it comes to planning the exact day you want to move, we recommend moving on a weekday, if possible. If you move on a weekend, you run the risk of government offices, like the post office, being closed. Also check out the weekly weather forecast. Are they predicting rain on Monday and Tuesday, but by Thursday it’s sunny skies? Sounds like the perfect day to move into your new home! At Schreiner Realty, your happiness is our priority. If at any point you have questions or are in need some helpful tips, we are here for you. So, if you are ready to buy or sell a home and are looking to work with the most professional and experienced realtors serving Gilbert, Chandler, Mesa and Tempe, get in touch with our team today! And check back next week for five more ways to make moving a cinch!